Snow Park Goa / Blog / What are the Winter sports activities you can enjoy at Goa? Goa, a region which is very much attracted by the tourists from all around the World; a place which is surrounded by numerous number of beaches, monuments, churches etc. Whether it is couples, friends, families everyone gets attracted by the beauty of Goa. The beaches at Goa offers the couples a feeling of romance, youngsters can have adventures at the beaches; families can have drinks there etc. If you are visiting Goa for the first time, then you just hear about the Winter sports activities in Goa that are very much common and you may be searching for those activities. This blog highlights the winter sports that you can enjoy in Goa. Thunder Strom: If you are an adventure lover, then this adventure will be the best and most amazing for you because here you will enjoy the real feeling of lighting and a heavy rainfall or a hail. Get the feeling of the most dangerous tornadoes and the hurricanes here too. If you enjoy playing snow volleyball, then at Goa you will enjoy the experience of playing volleyball in a snow, which is widely played at the Olympics only. So, enjoy that experience at Goa only. Climbing is a fun adventurous sport. The wall on which you have to climb will have many obstacles to make your wall climbing more adventurous. In movies or on TV, you must have seen the view of sledging car but in Goa, you will have the real experience of that. 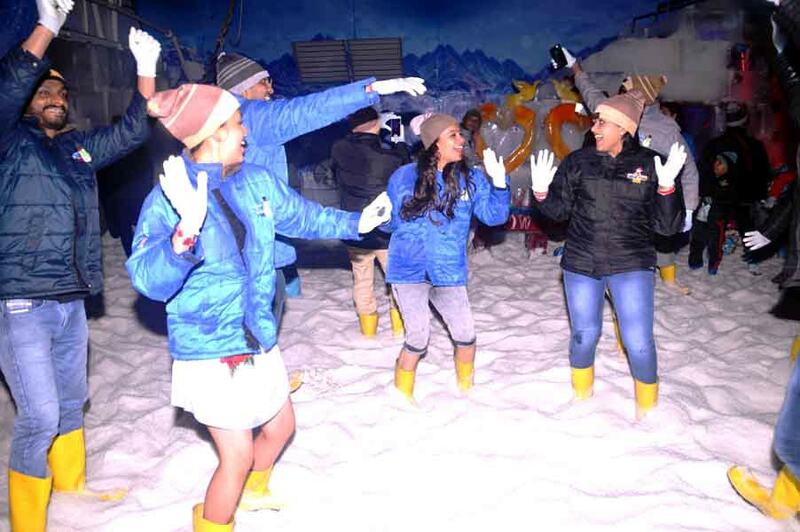 Enjoy the experience of DJ Dancing in Snow at the best Snow Theme Park in Goa. Whether you are travelling to Goa with your family, friends or with your loved ones then ice sliding is an entertaining activity where you will enjoy the cold rush of wind as you glide down the ice slope. If you want to have the feeling of Antarctica at Goa, then visiting the Ice Igloo will be filled with more fun and entertainment for you. Get a unique feeling that you are residing in a home which is completely made of ice. Drinks in Real Ice Glass: Enjoy your favourite drink in real ice glasses at Goa’s first Ice Bar. Pack your Bags and go on an adventurous and memorable trip at Snow Park Goa.